What Do Chameleons Sleep On? Chameleons are supremely adapted for perching on small twigs and branches -- chameleons even sleep while clinging to these perches. Most chameleons sleep near the same place they occupy during the day, but some individuals climb higher or lower before going to sleep. Chameleons of some species retreat into clusters of leaves while they sleep, to shield themselves from predators and cold temperatures. Most chameleons sleep while clutching a branch in the same area in which they feed. A 2011 survey by David A. Patrick and colleagues documented the average perching height of seven chameleon species. The study found that some species, such as bearded leaf chameleons (Rieppeleon brevicaudatus), slept about 1 foot above the ground while two-horned chameleons (Kinyongia matschiei) slept at an average height of more than 12 feet. Veiled chameleons sometimes climb higher than their typical activity height before sleeping for the night. When they do sleep, they may display their bold, vivid colors. Many species will drop to the release their perch and fall to the ground at the slightest touch, which scientists suspect is an anti-predator defense mechanism. Interestingly, some researchers have reported observing REM sleep in sleeping veiled and Jackson’s chameleons (Chamaeleo jacksonii). Chameleons -- especially young hatchlings -- often like to sleep on a branch directly below a leaf. The leaf makes it hard for predators to see the little lizards, and it also likely helps to prevent their body temperatures from dropping too low. Escaped pet chameleons have been found sleeping in small shrubs and trees. The boomslang (Dispholidus typus) is an important predator of chameleons during the day, but the creature will also hunt them during warm nights. Nocturnal birds of prey will also hunt and catch chameleons while they are sleeping and relatively defenseless. Scientists have recorded one species of nocturnal lemur (Lemur catta) capturing and consuming a chameleon at night, and this was probably not an isolated event. Predators are not the only animals looking for chameleons at night -- because they are found so much more easily during the night than during the day, scientists studying chameleons often find their subjects at night with the aid of a flashlight. Publishing their findings in a 2006 issue of “Behavioral Ecology and Sociobiology,” Tammy Keren-Rotem, Amos Bouskila and Eli Geffen studied the habitat use of the common chameleon (Chamaeleo chamaeleon). Part of the research process included collecting the chameleons at night, while they were sleeping. The team found a striking dichotomy between adults and juveniles -- the adults were always found sleeping several feet off the ground in the trees, while the young were found sleeping in grasses and bushes at ground level. The researchers attribute the habitat partitioning to the cannibalism exhibited in this species; adults will eagerly consume juvenile conspecifics. 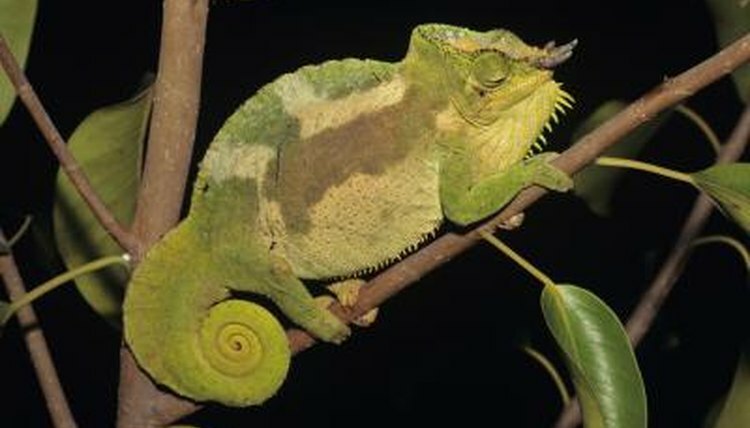 In 1982, Stephen M. Reilly studied the behavior and ecology of Schubotz’ chameleons (Chamaeleo schubotzi) in Kenya. Among other details documented in the paper published in “Journal of the Herpetological Association of Africa,” Reilly noted that one adaptation employed by the lizards to cope with their cold habitat was to sleep nestled in the dense vegetation of plants. Reilly contrasts this with the habit of species from warm habitats tending to sleep on exposed branches. What Animal Hangs Upside Down From a Tree in the Rainforest? What Do Turtles Do During the Daytime and Night?